Sculptural pepper mill and salt Shaker by Jens Quistgaard for Dansk. Steel Peugeot grinder works perfectly. Condition is excellent. 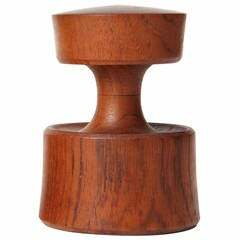 Dansk peppermill and salt shaker designed by Jens Quistgaard. Condition is excellent. Wonderful and rare flat screen table lamp in painted bronze and onyx. Originates from France during the 1930s. Lamp has been rewired and is in excellent condition. Rare and large ceramic work by Marianna von Allesch. 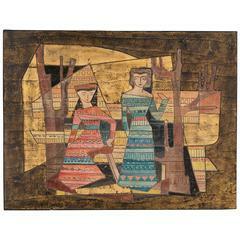 Incised design on ceramic panel. Signed lower right corner. Condition is excellent. Measures 18.5" x 24", with frame 28" x 33". Mid-Century Modern collectible pepper grinders designed by Jens Quistgaard for Dansk. Each piece is made of teak and is marked Denmark on the bottom. Price is for each. An elegant and simple teak pepper mill of an uneven hourglass shape; with Peugeot Frères steel grinder. Also stamped "Danmark" on bottom signifying pre-import era. 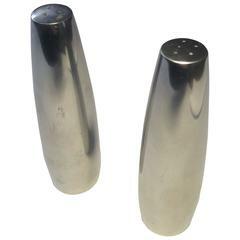 Vintage salt and peper shaker by Dansk. Set of four coasters by Jens Quistgaard JHQ for Dansk. Jens Harald Quistgaard carving set manufactured by Dansk Design in the 1960s in Denmark. Carving knife and fork with handmade teak handles.